You may notice a change in some of our cans soon. In the next few weeks, we will be transitioning to all stickered brite (blank/silver) cans. We thought you might enjoy learning a bit about the business of being a small, craft brewery, and wanted to share our story for making this change. When we first started canning, we loved the look of a fully painted can, but that was not feasible due to how many painted cans we would have to buy and store at a time. Our entire brewery was just 3,000SF at One Industrial, and there was nowhere to store the 25 pallets of empty cans that would come on a truck. As a compromise, we discovered shrink-sleeved cans, which gave us the flexibility we needed to purchase smaller volumes, but also the visual feel we were looking for at the time. However, as we grew, shrink-sleeved cans were not practical for all the different beers we were making, many at volumes where it did not make sense for the shrink-sleeving process. So, we started using sticker labels on brite cans for some of our brands, and received overwhelmingly positive feedback from our customers on this process. Furthermore, the more cans we labeled, the more we appreciated the freedom the smaller runs gave us to explore, experiment, and tweak, not just with our beers but also with the design of our labels. Further pulling back the curtain on our packaging operations, using stickers on brite cans also makes one of our internal logistical challenges much simpler. Our warehouse is about a mile down the street from our brewery. Every day that we package a different beer that requires a different can, we have to offload the brand-specific, unfilled cans that are remaining at the end of the day, re-stack and secure them, and then ship them back to our warehouse to make room for the new cans with the right shrink-sleeves for the next day. However, as we packaged more brands that required stickers and brite cans, and not the shrink-sleeves, it became clear how much better it was to not have to move a few cans back to our warehouse for use later. With stickers, all we needed to do is bring more brite cans from the warehouse for the next day, the empty cans now all moving in one direction. 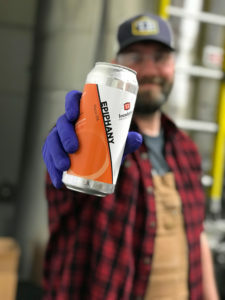 So, when we looked at the whole process, we felt it made sense to trial a transition to all brite cans with stickers, which is why you will start to see Afterglow and Epiphany cans that have sticker labels on the cans, and not shrink-sleeves. Cheers!